Dimensions: 8-13/16 in. x 9-1/2 in. 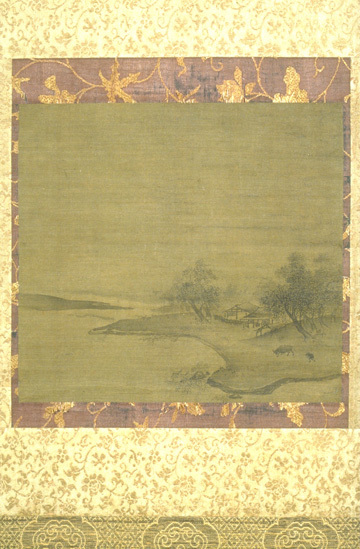 This tiny album leaf in ink on silk is now mounted so that it can be hung on a wall, but originally it was most likely one of several album leafs in an album of paintings. Even earlier, it may have been set into furniture, such as a wooden couch, so that the owner could view the painting up close while sitting or lying down. 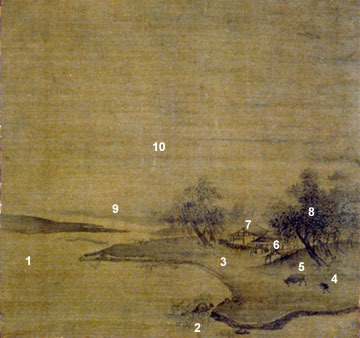 A river runs through the left side of the painting. In the foreground, reeds line the shore. And beyond that, all is lost in mist and sky. 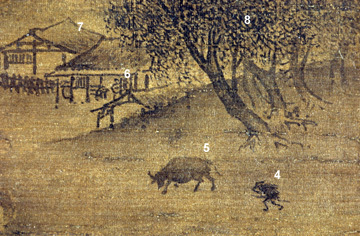 It is easy to see that the tree leaves are being blown and the branches are bending—the farmer is returning home during a storm. The sky is dark, and so strong is the wind that both the farmer and the ox lean forward into the wind, plodding slowly homeward. All this information about the weather has been conveyed economically with a minimum of brushstrokes, but careful attention to those strokes will show that each one captures that kind of movement typical of leaves or branches or reeds being blown in the wind. Peering out of the front door is the farmer’s wife, no doubt worried if he’ll make it back safely in this violent storm. This is a poetic vignette about family care. The underlying idea is the Mencian notion that all people—no matter what their occupation or state of education—know and experience family love and care. Due to the invention of a plow of modern design, a single Song farmer could plow as much land with one ox as his European counterparts could plow with two oxen. This meant that a single farmer and his wife could produce enough grain and silk to feed themselves and pay taxes to the state, so single family farm shown here is typical of those that constituted the main tax base for the Song polity. 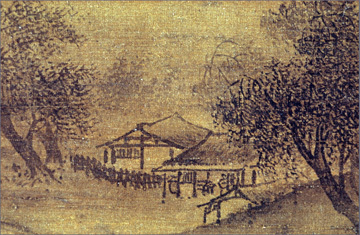 The painting, then, is about the everyday life of the “people,” min 民, the very fabric of the Song polity.